Can I Recover Files from Hard Drive with Bad Sectors? Hello, I have an 80GB Hitachi external hard drive. Today when I connected it to my computer, I got an error message "error 123 can't read sector 1". I can't access my hard drive since then. My lifetime data are on the drive and I want my data back. Please tell me how I can recover my all data. Many thanks. Once your hard drive is physically damaged or broken, chances for you to reclaim your files are small. But there are solutions for you to recover data from hard drive with bad sectors if the hard drive is only corrupted. The corrupted hard drive means there is system error with your drive and the files are just inaccessible. With a hard drive bad sector data recovery program, your data can be retrieved easily. 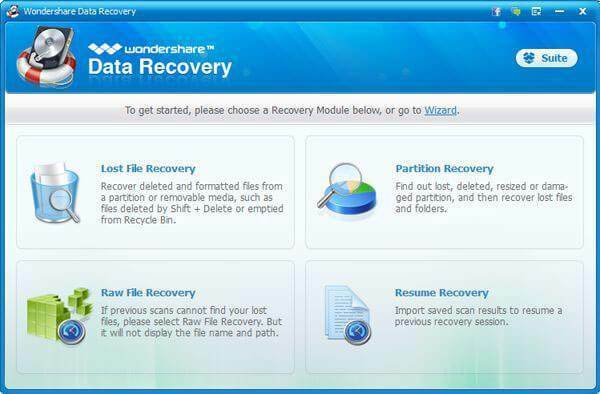 Wondershare Data Recovery, or Wondershare Data Recovery for Mac is such a trustful tool for you to recover data from hard drive with bad sectors. It’s able to recover all partitions from your hard drive. 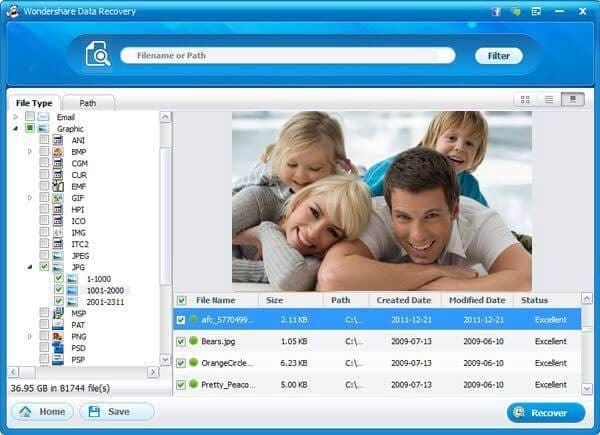 The power recovery feature of the program enables you to restore a huge amount of file types, including images, videos, document files, audio files, etc. Besides, it’s fully compatible with computer hard drive and removable hard drives. Download a trial version to retrieve data from hard drive with bad sectors now. Note: Lost data on your hard drive with bad sectors can be overwritten easily, you need to stop take that hard drive for any use if you want to reclaim all lost files. Moreover, please don’t install the program on the hard drive with bad sectors. 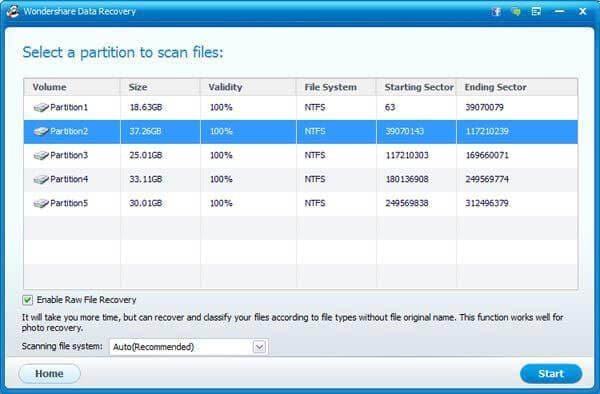 Both versions of the program have similar recovery operations, and I’ll show you how to process the recovery with Windows version of Wondershare Data Recovery. Just as the below image shows, after launching the program on your Windows computer, you’ll get a window with 3 recovery modes. 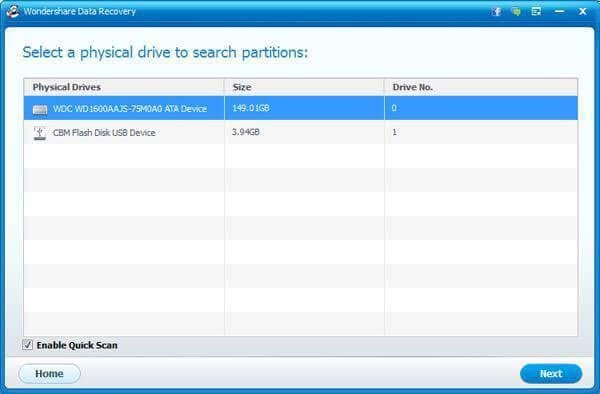 Let’s select “Partition Recovery” to recover retrieve data from hard drive with bad sectors. Step 2 Scan partition on your hard drive with bad sectors. In this step, you’ll need to select the hard drive with bad sectors in the window. Then you need to select the partition on that hard drive and click “Start” button to start searching lost files on it. Note: If you’re going to recover data from an external hard drive with bad sectors, please ensure that it can be recognized by your computer. After scanning, files on your hard drive’s partition will be displayed in the program window. You can view original folder names or file names to check how many of files on that hard drive with bad sectors can be reclaimed. In the end, you can mark files and folders you need and click “Recover” to save them to your computer. Note: To prevent recovered data from being overwritten, you can’t keep files to the original hard drive with bad sectors. Actually, there is solution to fix your hard drive with bad sectors if the drive is not damaged. You can read How to Fix Bad Sectors on Hard Drive and use Wondershare Liveboot 2012 to solve this problem. But before you solve the program, you’d better recover data from it firstly.